Master Monk of the Thai Karen and H’Mon people. Gaeji Ajarn of Kanjanaburi Province. LP Uttama is a high ranking monk of Royal Decree. Especially his Prakam rosaries and Monk Coins are extremely revered and sought after by devotees. 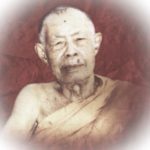 Arya Sangha, Tudong Master, LP Kasem was one of North Thailands Greatest Amulet Makers – Revered even by members of the Thai Royal Family. His purity and renunciation is legendary, as are his Sacred Amulets which have spurred many a tale of Miraculous Events. From the status of Abbot to running away to stay in solitary in a wild ancient mountain forest, Luang Por Kasem was famous for thew fact that his food would rot in the almsbowl, for his non-attachment to food as a form of pleasure. Considered one of Thailand’s Greatest Arahants. 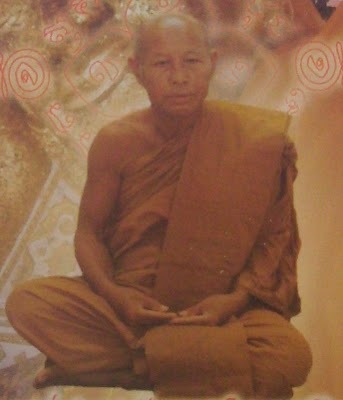 Luang Phu In Khemataewo – Wat Nong Meg (Surin) – Master of Wicha Khmer – Maha Sanaeh Metta Choke Lap. As he was still a young man, he was already a Master of Wicha Maha Sanaeh (attraction and riches charm). As a layman he loved to practice Maha Sanaeh magic. When he ordained, because his inclination was to make amulets, he sought out a dozen or more great masters to teach him their various Wicha……. 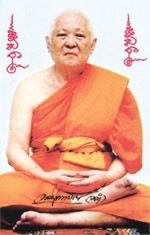 Pra Kroo Intawarakun, or, ‘Luang Phu Rit Radtanachoto’ – Abbot of Wat Chonlapratan in Buriram. LP Rit is a Master Gaeji Ajarn of the Isan country, who has many faithful devotees in both Thailand as well as International territories. 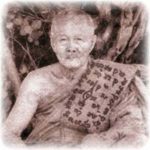 Apart from his famous Jing Jok amulets made from Deer Horn (Khao Gwang), LP Rit is also known for his Tagruds and his ‘Khunphaen Prai Gumarn’ amulets, which have attained a name for their power of attraction due to the prai oil in the amulets. Few Khun Phaen and Gumarn Tong amulets have real prai Oil in these days, for which LP Rits Gumarn and Khun Phaen amulets are worthy of wearing. The amulet mixture stays seemingly faithful to the ancient formula. Luang Por Sawad – Wat Kaset Sukh (Payao). Otherwise known as ‘Por Phu Ruesi, ex Ruesi Forest Hermit Sage, Luang Por Sawad is one of Payao’s greatest Gumarn Tong and Pra Khun Phaen makers. His Bia Gae and many other kinds of amulets and charms are all recieving both Local and International interest, as his Merits and Magic powers become ever more famous. Luang Por Lum Siritammo was born with the name Lum Sae Jeng, and was born on the 13th of August 2472 BE on a Saturday of the 11th Lunar Day, in the Year of the Snake. He was born at 14:44 PM in the afternoon, at home in Ya Praek district of…. 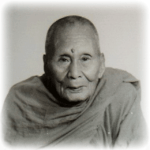 Ajarn Nong was Ordained as a Bhikkhu at the age of 21 in 2482 BE. He led a life of practice worthy of reverence. 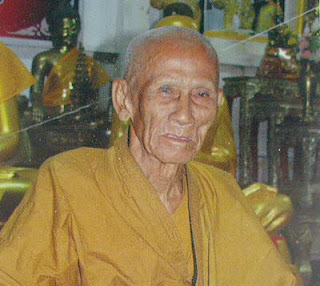 Ajarn Nong was one of the most important makers of Luang Por Tuad amulet in the history of Thai Amulet making. 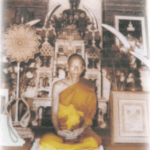 He became the Abbot of Wat Sai Khaw in his Birth Place of Pattani, in Ampher Koke Po. Luang Por Jamlong – Wat Panom Yong. Luang Por Jamlong is a master amulet maker of the kind who do not seek attention, but whose great ability in empowering amulets with intense Metta is recognized by many of Thailands great Masters, who have commented on his powers and shown high esteem for. Maker of the joked about ‘Tagrud Kor Hmaa Ayuttaya’ (Dogneck amulet of Ayuttaya), and more seriously, the small but amazingly powerful ‘Tagrud Dork Mai Sawan’ (heavenly flower Tagrud), which has brought stories of great luck and fortunes from those who have revered and worn it. 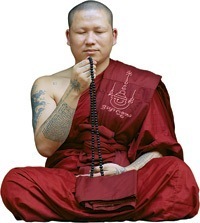 His Choo Chok amulets are immensely successful for his years of experience in Choo Chok magical chanting. 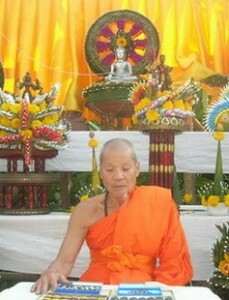 Luang Por Bpan Wat Na Dee (Sra Buri). Luang Por Bpan Gadtabano of Wat Na Dee in Sra Buri, is a Master Gaeji Ajarn of the present Era, who was reared by Luang Por La at Wat Gaeng Koi from a very young age of seven years old. He is the carrier of the Wicha Serm Sirimonkgol Gao Jut (nine pointed blessing), which he recieved from Kroo Ba Duang Tittawaro of Wat Witraymul. 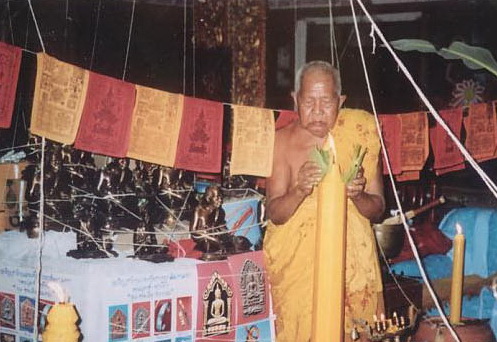 Kroo Ba Subin also possesses the Wicha of Sado Kro from Kroo Ba In Gaew of Wat Walugaram. Kroo Ba Subin is now disrobed since sometime in about 2556-2557 BE, and is now known as Ajarn Subin. 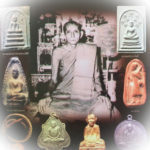 He is now at liberty to produce amulets of both the Buddhist, and the Dark Arts variety, but remains with greater leanings to making the Buddhist and Animist Metta Maha Sanaeh Maha Lap Kaa Khaay type amulets, for which he was always famous for. Luang Por An Apibalo, Wat Tamma Kosok (Wat Rong Koh) Utay Thani, is a top Gaeji Ajarn Guru Master Monk who is a local of Utay Thani. He is lovingly known as “Pra Jee Gong’ or ‘Luang Por An Taewada’, or ‘Taewada Dta Tip’. He used to be a Police officer, who U once worked together with the famous Rang Song Brahman Master of Jatukam Ramathep fame ‘Khun Pantaraks Rachadej’, who was also a Police Officer who hunted down the most wanted Outlaws. Luang Phu Waas – Wat Sapan Sung (Nontaburi, Bangkok) Luang Phu Waas is Abbot of Wat Sapan Sung, in Nontaburi. Wat Sapan Sung is a very Famous Temple which first became known for its powerful amulets during the time when Luang Phu Iam was Abbot. Since then, three Generations of Masters have carried the Wicha of Making Pra Pid Ta, and Takrut amulets down from Luang Phu Iam…. 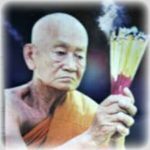 Luang Por Guay Chudtintaro, of Wat Kositaram in Chainat, was a Great Sorceror Monk with Powerful Kata Akom, and Mastery of the Wicha Sak Yant. In addition, he would perform empowerments during the various ‘Reuks’ (Astrological Influential moments), to bring total coverage of protection and fortuitous blessings to all who might wear and Bucha his amulets. 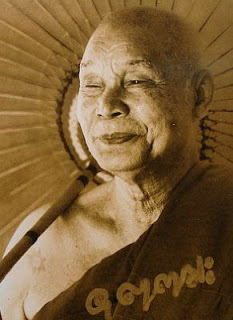 Luang Por Phaew of Wat Tanode Luang, was a Lineage Master and Inheritor of the Wicha of the Great Kroo Ba Ajarn Luang Por Tong Sukh (Wat Tanode Luang), who was his Mentor, and Predecessor. Luang Por Phaew learned all of the Wicha with Luang Por Tong Sukh, and was his assistant throughout until the passing of his Kroo Ba Ajarn. The amulets of Luang Por Phaew were made continuing the methods and style of Luang Por Tong Sukh, preserving the Wicha in Continuation. Amulets of the Great Thai Buddhist Masters; Each Category of Luang Por will contain a synopsis about each Guru master and display our showrooms selection of amulets by that particular Luang Phor. Please click on the image of the Luang Por whose amulets you wish to view; e.g. 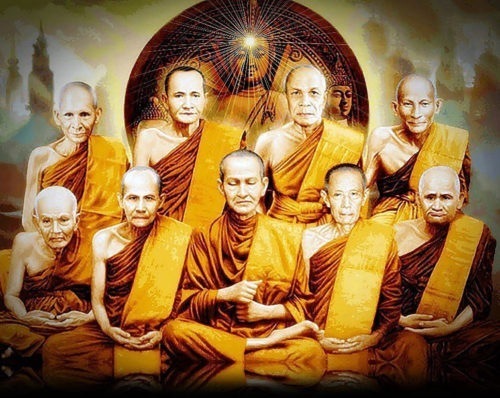 Luang Por Thuat, Luang Por Derm, Luang Por Phern, Luang Por Ngern, Luang Por Prasut, Kroo Ba Dech, Kroo Ba Noi etc..... 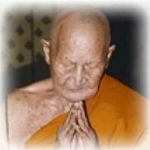 The list of Luang Pors whose amulets have attained great fame, reverence and even International Interest and Followings, is incredibly long, and this page is where you can find amulets from all of the many Thai Guru Master Monks we have in store.